STOP PRESS! 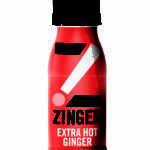 NEW category added to the Janey Loves Platinum Awards last minute!! 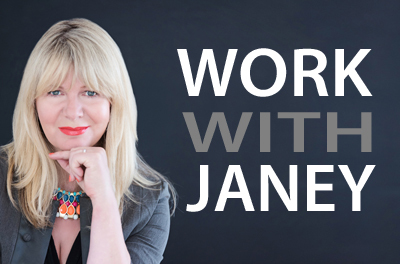 The Janey Loves Platinum Awards officially close at Midnight on 3rd August BUT I have come across something of a phenomenon too good to miss out on sharing….Last week end I attended The Mindful Drinking Festival – what an eye-opener! There are some incredible grown up non alcoholic drinks just come onto the market and we would love to celebrate them! Meanwhile here’s a report from the Mindful Drinking festival.. The summer is here, you are out for a BBQ and someone offers you another beer or chilled glass of wine, fine except that you are driving. What’s the alternative? Only a few years ago an alcohol free drink meant fruit juice, lime and soda or a fizzy kids drink, the times they are a-changing! Thank Goodness, whether you want to moderate your drinking, be the designated driver or have quit completely, there’s no reason why you should be able to opt for a decent ‘grown up’ drink when you go out or to treat yourself at home. Alcohol Free beers used to be dismal and the only wines on offer tasted like, as my son so eloquently put it…apple juice gone off. The trend is massive now and fortunately there are more and more producers coming on board. 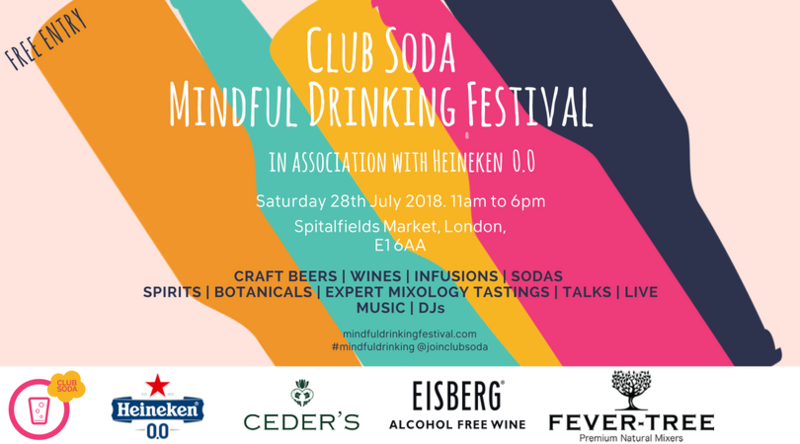 The online community Club Soda have just hosted their third Mindful Drinking Festival in London, The founder Laura Willoughby says..
‘I Gave up drinking six years ago, and realized there wasn’t really anything around to help people self-guide their journey, no equivalent of weight watchers…for booze, so I wanted to set up a big supportive community to help people with behavioural change around drinking, regardless of what the goal is, whether it’s to cut down, stop for a while or quit. At Club Soda we’ve slowly built 20k members, who still go to bars and restaurants and don’t want to be palmed off with a sweet child’s drink The term Mindful drinking might mean you choose to drink, but you consider the time and place, or drinking some days, not others, but you are ‘thinking’ about it, it’s not automatic. Statistics show that people lose two weeks of their life every summer to hangovers! 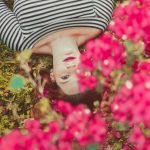 Mindful drinking is about you deciding what your relationship with alcohol should be’. There was an incredible amount of choice at the festival from non-alcoholic beers such as Heineken 0.0 (did you see their TV ads during the Love Island episodes?) jostling alongside the artisan non-alcoholic beer brewers such as Nirvana and Fitbeer. 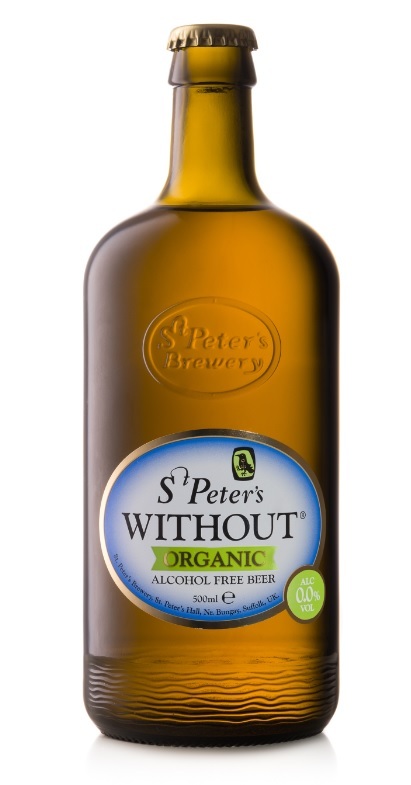 and St Peters Without, Launched by Suffolk micro-brewery, St Peter’s, Without® Organic is at the very height of healthy brewing as its vegan, organic and totally alcohol free. 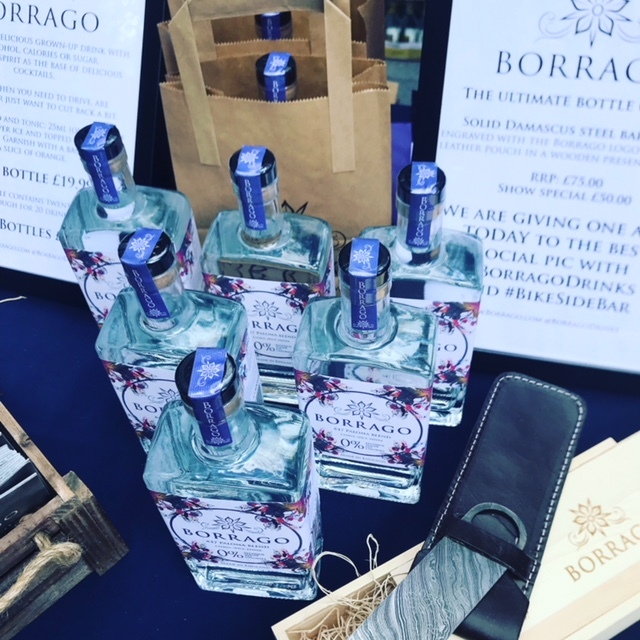 2018 is the year of botanicals and there were 7 brands featured including Ceders sold in Sainsbury’s, There’s one called Borrago which is awesome, the bottle is beautiful and it has no alcohol, calories or sugar, and then there are drinks like Kombucha and ‘grown up’ juices. 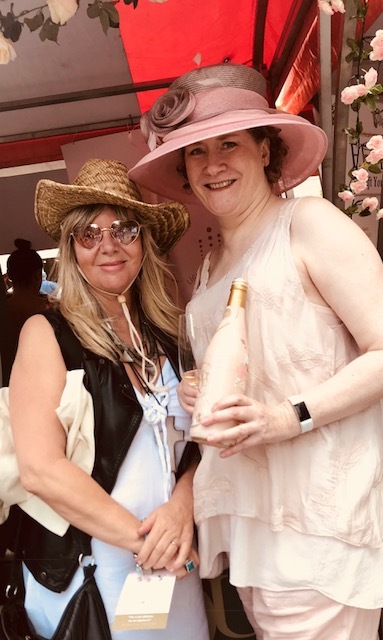 I also loved the unique Botanique, a fabulous alternative to fizz, here I am with the brand owner, she is as exotic and bubbly as her drink! 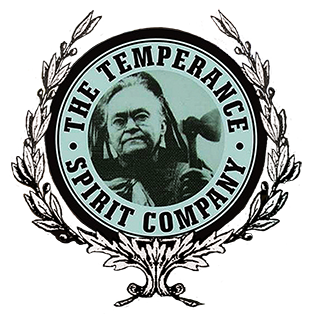 You can get lots of these fabulous non-alcoholic options from Wise Bartender who have possibly the biggest online collection, Tom the main man is very knowledgeable about everything from the ciders to the wines and the botanicals! Its opened up a whole new world, you really can now party on….and still drive home, I’ll drink to that!